Wildwood Custom Bluegrass Model 5 String Banjo (1971), made in Arcata, CA, shaded maple finish, Maple neck, rim and resonator, ebony fingerboard, black hard shell case. This is a nice playing and sounding Mastertone that is not an EXACT Gibson copy, although it is of course similar to the unassailable standard in most ways. It was hand-built by Mark Platin in the very earliest days of the Wildwood banjo brand, before the company proper was even founded. At the time Brooks Otis was the proprietor of Wildwood Music store in Arcata, California, and Mark was making banjos in the back of the shop. Wildwood was established as an independent brand in 1973, and over time grew to a fairly large operation before scaling back to more of a custom builder in more recent years. Their signature instruments were still made in small numbers up through 2018 when founder Mark Platin retired the brand. This banjo is a lovely example of the earliest pre-company Wildwood banjos, and a Mastertone model with its own personality. These early Wildwood Music Shop banjos were all individual custom instruments. This one has a label reading: THE WILDWOOD MUSIC COMPANY Model: Custom Bluegrass- Woods Fiddleback Maple, Ebony. Built By Mark Platin 3/12/71. Beneath that there is an additional inscription from a later owner and a date of 9-20-01. The instrument is made of very high-grade materials throughout. It features a laminated block maple rim (a signature Wildwood feature) with a no-hole flat-top tone ring and nickel-plated pre-war-style flange. The resonator has dark binding and marquetry on the edges and a subtly flamed maple back. The fancy curly maple neck is attached with a single lower co-ordinator rod and an upper bolt, in the manner of some pre-war Gibsons. The ebony fingerboard has a traditional Flying Eagle inlay pattern, as does the headstock. The fingerboard is bound and underlaid with marquetry to match the resonator. The tuners are period nickel-plated Planets including a geared 5th string peg. The neck is slim and comfortable and this is a fine playing and sounding banjo. The tone is rounder than some Mastertone style instruments, and the banjo has a more individual personality than many of the more common Mastertone clones. 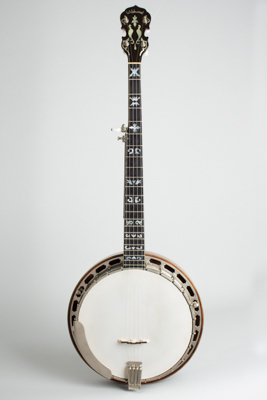 At the time this was made there were few choices in a professional-level Bluegrass banjo; what Gibson was building in 1970 was still far off the goal of what most players wanted and older examples were becoming very sought after. Handmade Bluegrass banjos from small custom builders in this period proved that there was a big market for really nice instruments of this type, and many players eager for them. Overall length is 38 in. (96.5 cm. ), 11 in. (27.9 cm.) diameter head, and 3 1/2 in. (8.9 cm.) in depth, measured at side of rim. Scale length is 26 in. (660 mm.). Width of nut is 1 3/16 in. (30 mm.). This banjo some light signs of wear but does not appear heavily used. The nickel plating shows some clouding overall but no major loss, and the finish shows only very minor wear. The only alteration is several railroad spikes have been ground down on the fingerboard and a sliding 5th string capo added. It is set up with a plain frosted head and a compensated bridge, in a period hard case. Excellent + Condition.